A prominent civil rights group has sent the City of Elk Grove a letter threatening a lawsuit saying the city is violating the California Voting Rights Act. The letter from Malibu, California-based attorney Kevin Shenkman was sent on behalf of his client, the Southwest Voter Registration Education Project. That San Antonio, Texas-based group is a civil rights group with a focus on Latino voter rights. The four-page letter addressed to Elk Grove City Clerk Jason Lindgren says the city’s current form of from district representation is in violation of the California Voter Rights Act (CVRA) of 2001. A from district system, which some refer to as at-large, requires that a representative is from a particular defined district but is elected by the entire jurisdiction. 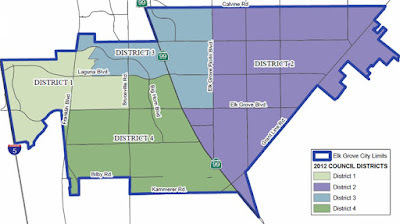 Elk Grove currently has four districts and each council member is from one of the districts but is elected by the entire electorate in the city. The mayor is elected on a citywide basis. an at-large, or from district basis. The lawsuit claims that the from district system district dilutes minority votes, in this case, Latino voters and thus violates the CVRA. In the letter, Shenkman refers to three Latino candidates, all in District 4, in 2002, 2006, and 2014 that were adversely affected by the system despite having significant support from Latino constituents. The letter states “Elk Grove’s at-large [from district] system dilutes the ability of Latinos (a “protected class) – to elect candidates of their choice or otherwise influence the outcome of the City Council’s election.” Currently, there is one Latino declared candidate for the city council, Orlando Fuentes, who is running for the District 4 seat against Stephanie Nguyen. In the correspondence, which was obtained by a records request and can be viewed below, Shenkman also references extensive case law supporting their claim. Additionally, Shenkman highlighted litigation successfully pursued against the city of Palmdale, California for violation of the CVRA based on from district representation. As a result of his victory, Palmdale was compelled to pay Shenkman's and other plaintiffs attorneys fees which amounted to $4.5 million plus interest. The litigation between Shenkman and Palmdale lasted three years. "Not only will Palmdale have fair and inclusive elections, but other cities will look to Palmdale as an example of what happens if they refuse to comply with the California Voting Rights Act," Shenkman said in a 2015 story from the Los Angles Times. Along with the suit against Palmdale, Shenkman has convinced other California cities to change based on CVRA violations. In another story from the Los Angeles Times, it was reported "Shenkman sent demand letters to Hemet, Wildomar, Hesperia, Upland and Costa Mesa, among others. All adopted district elections for no later than 2018. Other cities that have recently made the switch include Oceanside, Carlsbad, Vista, Fremont and Anaheim." 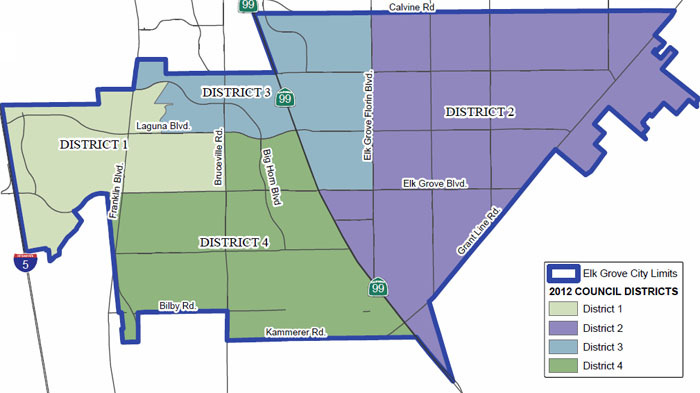 Four members of the Elk Grove City Council – Steve Detrick, Pat Hume, Stephanie Nguyen, and Darren Suen have opposed switching to a by-district form of representation saying it makes representatives more responsive to the entire city, not just one district. Mayor Steve Ly, who also against by-district elections when he occupied the District 4 seat, changed his position once he was elected Mayor in 2016 and now must be elected on a citywide basis. Notwithstanding their arguments on responsiveness, incumbents in Elk Grove and other jurisdictions prefer from-district or at-large as it makes it financially difficult for challengers, who usually have substantially less campaign funding, to unseat them. Many political observers put the price tag for a challenger to run a successful campaign against a seated council member in Elk Grove at a minimum of $200,000. Shenkman's letter, which was received prior to the most recent city council meeting on February 28, was not placed on the closed session agenda for that recent meeting. Frequently city attorney Jonathon Hobbs will place an agenda item on the closed session without specifics to discuss anticipated litigation the city faces. Region Builders is thinking, oh no, now we have to throw more money into campaigns to cover our bets! Better get Kronick, Moskovitz, Tiedemann, and Girard on the hotline! Great article, Elk Grove News, and posting of the Kevin Shenkmen, Esq. letter so that the readers can read it for themselves. Darren Suen’s comments in The Sacramento Bee article are very interesting. Much like what he stated at an Elk Grove City Council meeting when many residents requested by-district voting, his rationale included a statement about having “three Asians on the city council,” implying that is minority enough. Also, Suen inferred in the Bee article that for him to “care” or to “be accountable” to the entire city, it would have to be legislated for him to do so. Is that being a true public servant? Are his interests that parochial? Can the Elk Grove City Council afford a lengthy lawsuit, using taxpayers’ money, when it is already law that we, by right, can institute by-district voting? Palmdale had to pay 4.6 million dollars in legal fees to Shenkman after they lost. That amount didn’t include what the city of Palmdale paid their outside attorneys. Close to 10 million dollars in legal fees and interest I would venture to guess. Is that being sound fiscal stewards of the people’s money? How would that translate to the voters when the Elk Grove City Council also wants a sales tax increase? Could that be the real reason the Elk Grove City Council has dug in their heels? District 4 discrimination against minorities? There could be something to that claim and it comes straight from the Elk Grove City Council. One only has to reread Michael Monasky's Op Ed regarding Steve Detrick's comments concerning selecting a woman, both of whom happened to be minorities, one Latino and one African American, for the Elk Grove City Council is like "picking a girl for the prom."